I wanted some macaroons--so I went to Honoré and bought 5! I've now tested all the flavors I got. Granted, these are the first macaroons I've ever had so I don't have much to compare them to, but I have to say they were amazing! They were everything I hoped they would be. 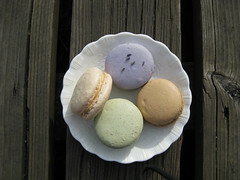 I chose lavender, coffee, pistachio and another one which I think was chocolate/coconut/salted caramel. They had about 10 flavors in all and i wished I could have got one of each, but unfortunately I was on a budget! I'm a sucker for all things lavender flavored - I had a feeling those would be my favorite so I bought two. I was right! 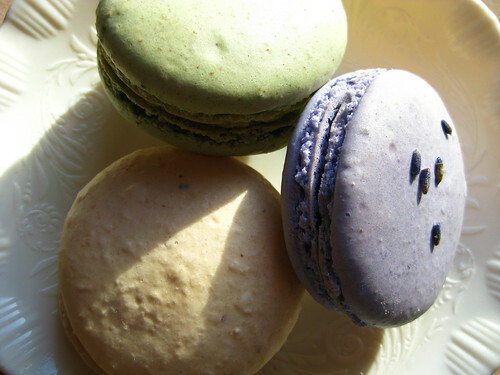 The lavender flavor was just right, they were topped with little flowers, and had a delicious creamy chocolate filling which I didn't expect. The coffee one had a rich coffee flavor which was very satisfying. The pistachio flavor was very nutty and tasted just like pistachios... except sweet! Lastly, I finished off the mysterious chocolate/coconut/salted caramel this morning. It was so good! I could definitely taste the salted caramel, and there were little bits of coconut inside the cookie. So to sum it up - they were all good, and all different. I want to go back and try more flavors! On another note about Honoré's general awesomeness - the girl working the counter was so nice. 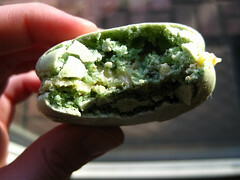 She listed off all 10 or so macaroon flavors to me, sweetly, without an eye roll in sight! We also got a croissant which was very good, and they had a bunch of other pastries that looked really yummy. Honoré is open Wed.–Sun. ; 1413 NW 70th St.; 206.706.4035.